All systems are go for just one week from now. SpaceX’s Crew Dragon passenger spacecraft is launching atop a SpaceX Falcon 9 rocket from Cape Canaveral in Florida on March 2 — but with only a spacesuit-wearing dummy on board. It will then attempt to autonomously dock with the International Space Station after reaching orbit early Sunday morning. NASA and SpaceX officially decided to proceed with plans yesterday for the first ever test flight, dubbed Demo-1 (or DM-1), of SpaceX’s Crew Dragon passenger spacecraft. SpaceX’s Crew Dragon went vertical for the first time earlier this year at Cape Canaveral, readying itself for the test launch. Demo-1 was originally planned to take place on January 17. SpaceX successfully test fired the Falcon 9 rocket that will hopefully launch Crew Dragon to space on January 25. If all goes according to plan, SpaceX could make history by sending astronauts to space from American soil for the first time since the Space Shuttle’s last trip back in 2011. Since then, NASA has been relying on the use of Russian Soyuz spacecraft to ferry astronauts to and from the International Space Station. 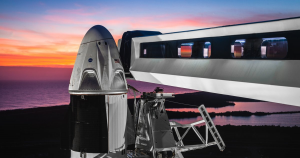 The Crew Dragon capsule can seat up to seven astronauts. One giant screen takes care of almost all control features of the futuristic spacecraft. The dummy that will fly on board the Dragon during Demo-1 is outfitted with a number of sensors to collect vital data during launch. “I fully expect we’re going to learn something on this flight,” Bill Gerstenmaier, associate administrator for NASA Human Exploration and Operations, said during a news conference yesterday.